The crunch of whole-grain cornmeal is one of those really pleasant culinary experiences for me. I’m sure that sounds odd (corny, even) to some… but I just love diving into a muffin or cornbread or a crust that has cornmeal included and biting into that grainy texture. It absolutely must be whole-grain cornmeal… the regular stuff just doesn’t do the deed. 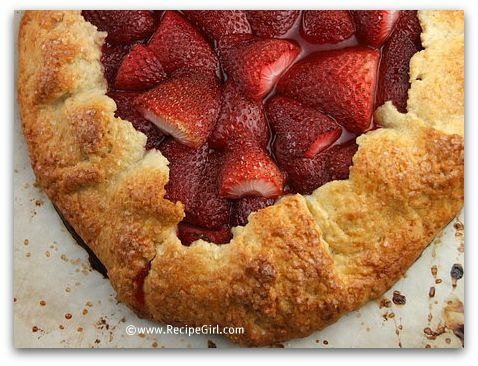 So when I saw a recipe on Maria’s blog, I was immediately drawn to the crunchy crust, and from that, I created the Rustic Strawberry Galette. 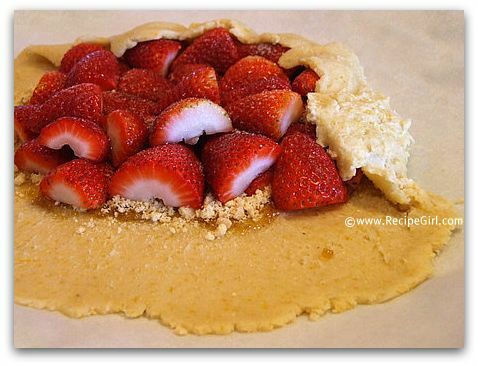 The crust is a lighter buttery sort with whole grain cornmeal included. You must use the grainy cornmeal or it just won’t be the same. 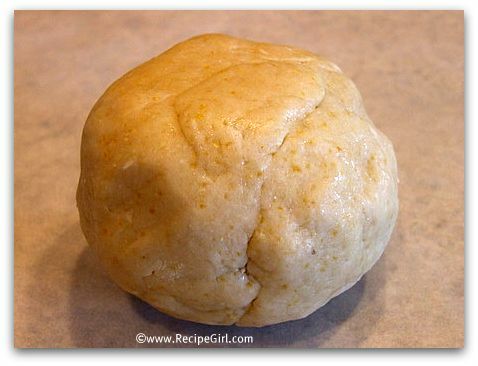 After a short chill in the fridge, the dough is rolled out into a roughly-shaped circle. In order to create a nice space to work with, I used a pot lid to gently push in a circle (leaving 1 1/2 to 2 inches around the edges). I knew I didn’t want to create a typical galette, so I experimented with a couple of ingredients that I had lying around: fig jam and shortbread (Girl Scout) cookies. 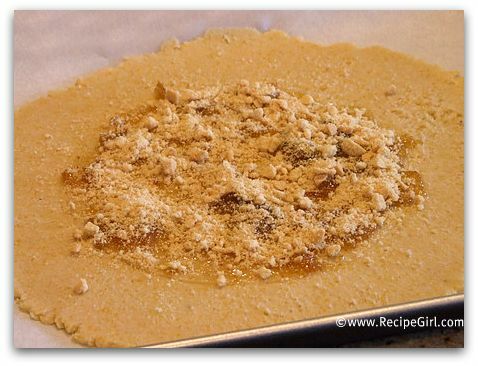 I spread the fig jam around the circle and then sprinkled with crumbled cookies. 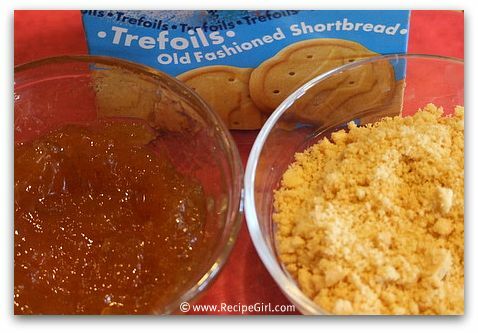 You could use apricot jam in place of the fig, and probably something like graham crackers in place of the shortbread cookies. Two layers of halved strawberries were placed on top of the crumbly mixture, and then I gave them a light sprinkle of cinnamon/sugar. Here’s where things get a bit rustic looking… the crust is gently folded over at the edges- scraggles and all. I brushed a simple egg wash over the edges and sprinkled some turbinado sugar along the crusty edge. In the oven to bake for about an hour! The galette looked a little juicy when I took it out of the oven. After resting for a while though, it was clear that the liquid would not be a problem. 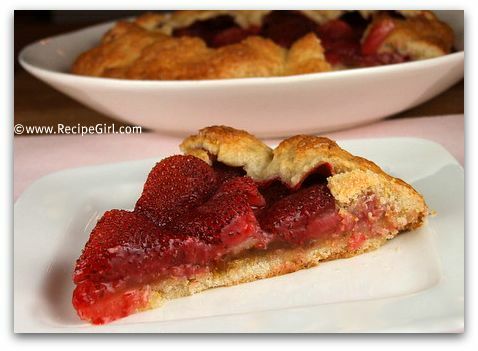 The crumbly cookie mixture provided a place for the strawberry juices to sink into to, while the jam protected the bottom of the crust from becoming soggy. I love the rustic touch of galettes so much! There is so much to yours that I love. From the cornmeal in the crust to the fig jam center and shortbread cookie crumbles. Fabulous!!! looks sooo appetising! Love the rustic look. Beautiful looking tart! I’ve wanted to try cornmeal pastry but wasn’t sure what filling to use. This sounds great! 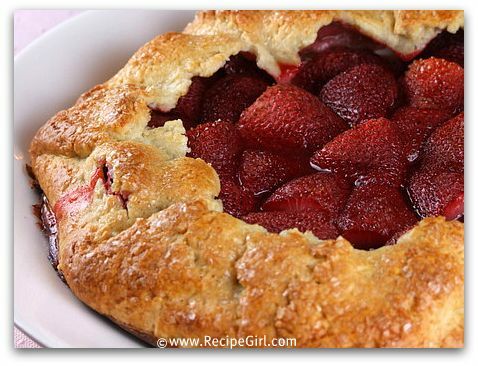 This galette recipe looks terrific. Thanks for posting and for all the great pictures. 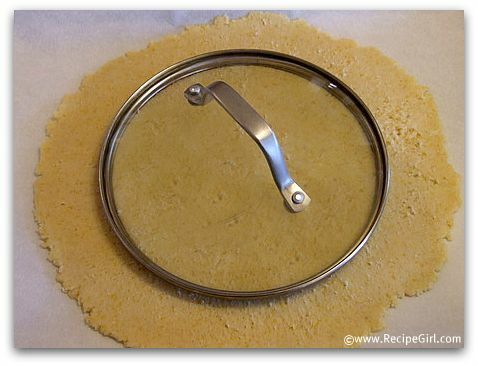 Love your tip on using the pot lid for a perfect circle. What a great idea! The galette looks beautiful. Fig jam is may favourite and can’t wait until next month to make some. 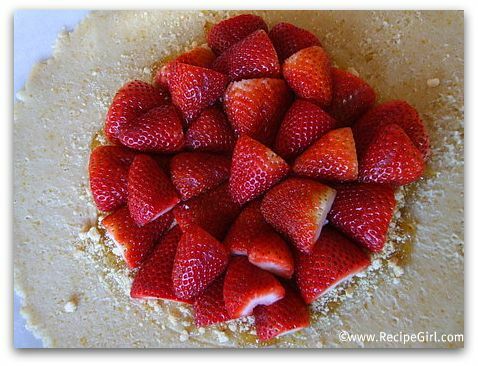 Pity there will be no strawberries then to make this galette as the combo sounds delicious. Lovely & so yummie dessert! Excellent! What a good idea to use the cookie crumbs! I agree there is something wonderful about whole grain cornmeal. RecipeGirl! This is just my favorite kind of dessert. And how resourceful you are to use Trefoils. I bet they add a nice crunch and flavor. Yum!! This dessert looks picture perfect. I absolutely love it. I’m w/ya! I love the added crunch of cornmeal. Duh, I didn’t realize I needed the whole grain variety! Thanks. Your galette is gorgeous and I’m certain tastes even better! Yum. 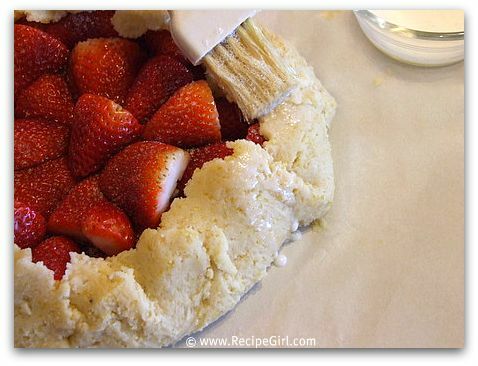 I love the idea of cornmeal in the crust.